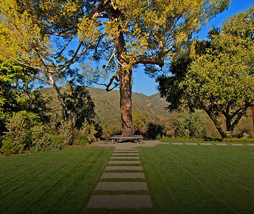 Caron Veazey’s classic Edward Fickett house in the Hollywood Hills gets a contemporary update. To do that, Pharrell hooked the couple up with New York architect Alexander Gorlin, who enlisted L.A. architect Dan Brunn to help rebuild and update the structure while remaining true to Fickett’s design. “The house wasn’t as cared for as it could have been,” says Gorlin. “The original house was remodeled at some point, so we wanted to bring it back to what it was,” adds Brunn. They collaborated on a floor plan that opened up spaces that had been previously closed off, including the kitchen, a small walled-in room that wasn’t conducive for contemporary entertaining. 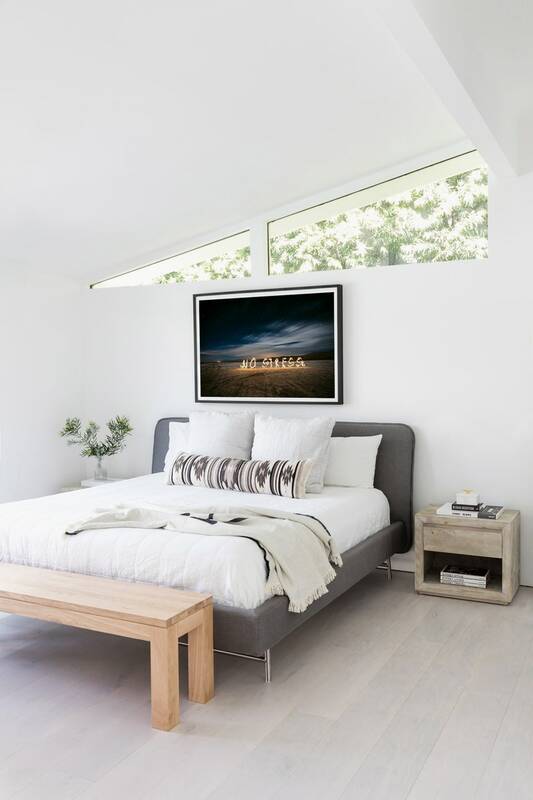 They also combined two of the house’s three bedrooms to create a serene master suite in the back of the house, adding storage and shifting the third bedroom-slash-office to the space once occupied by a pair of closets. “Although the house is a midcentury, I didn’t go with purist midcentury decor; eclectic is more our vibe,” says Veazey. A Blu Dot bed is covered in Parachute percale linens in the master bedroom. The bedside tables are by Restoration Hardware, and the art is by 2wenty. The result is a home that honors its past as much as its present, maintaining historic roots while providing contemporary comfort. “Although the house is a midcentury, I didn’t go with purist midcentury decor; eclectic is more our vibe,” says Veazey. Though the couple’s work takes them across the world for much of the calendar year, the house has become an inviting refuge during off days. “Our home is very relaxed and calming,” she says. “I feel super peaceful as soon as I walk in the door.” And probably a little happy, no doubt. Article originally posted on Architectural Digest on March 28, 2018. The Noorens fell in love with San Diego and the surrounding area during a surf vacation several years ago, and made it their mission to return for good. When they finally returned in 2009, they incorporated elements of the landscape of La Jolla into a custom, eco-conscious home. Jack and Jill Nooren have long hoped to live a more environmentally responsible lifestyle, and after visiting and falling in love with San Diego eight years ago while on a family vacation, they committed to relocating to the coastal community. 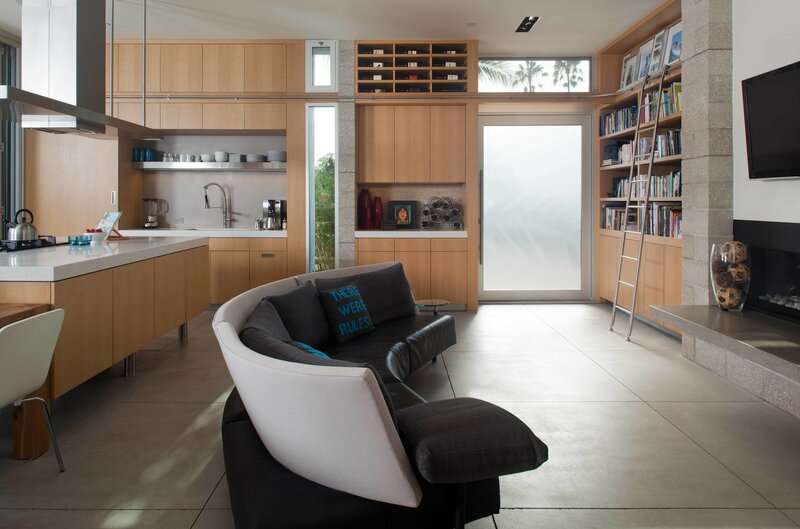 The couple returned to the area in 2009 with their two children, and with the help of domusstudio architecture and Hill Construction Company, spent three years designing and building a custom, eco-conscious home that is elegantly integrated into the natural landscape of La Jolla. Large, glass, accordion-style doors from LaCantina Doors open the family dining room to the home’s outdoor space, ensuring airflow and ocean views while effectively doubling the size of the room itself. The custom wood table and benches were made by Hill Construction from reclaimed California redwoods. 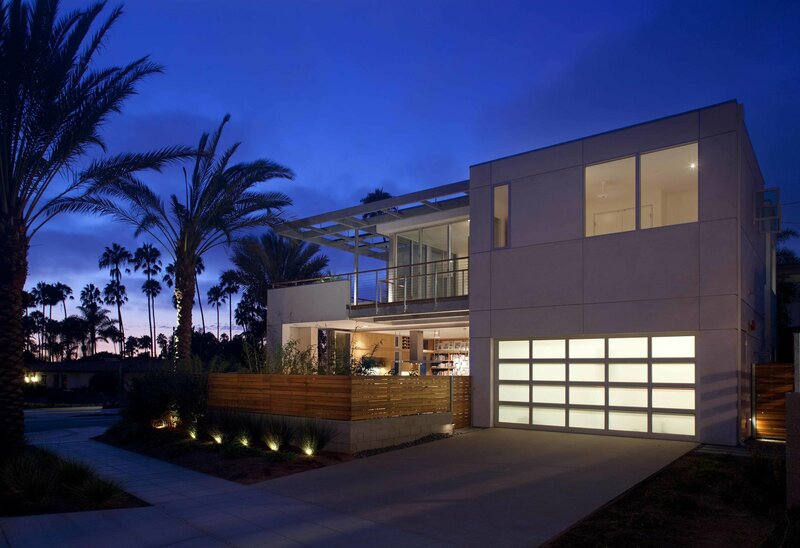 Although the Noorens were forced to demolish the previous home on the property—a 1927 Spanish house that was one of the first in the La Jolla Shores area—they took great pains to recycle as much as possible from the demolition process, integrating original pieces with local, eco-friendly materials into a fully sustainable home. The property boasts energy-saving appliances, low-flow showerheads and faucets, dual-flush toilets, and LED lighting, while concrete floors with radiant heat from the rooftop solar panels and open windows ensure no unnecessary energy is spent on heating and cooling the home. Windows are scattered throughout the house in order to let in natural light wherever possible, while custom furniture with clean, minimal lines contributes to the natural palette. 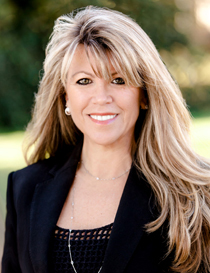 Committed to educating their family and friends about the importance of living sustainably, Jack and Jill used the process of designing and constructing their home as a means through which to teach their children, as well as the community around them, about the benefits of an eco-conscious lifestyle. Today, the Noorens’ home is not only certified as a LEED Platinum project, integrating mild climate indoor-outdoor spaces and utilizing radiant heat and solar thermal systems, but it is a beautiful, airy space with an abundance of natural light and a simple palette of natural, local, and low-maintenance materials. 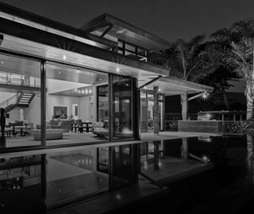 An important aspect of the home’s design is the seamless flow between inside and outside, which is enhanced not only by large windows and doors, but also by the home’s materials. The majority of the surfaces and structural elements in both the interior and exterior are composed of concrete, stainless steel, and wood, ensuring a unification between the two while guaranteeing durability. Concrete floors require little maintenance, while local wood helps the home blend into its surrounding landscape. 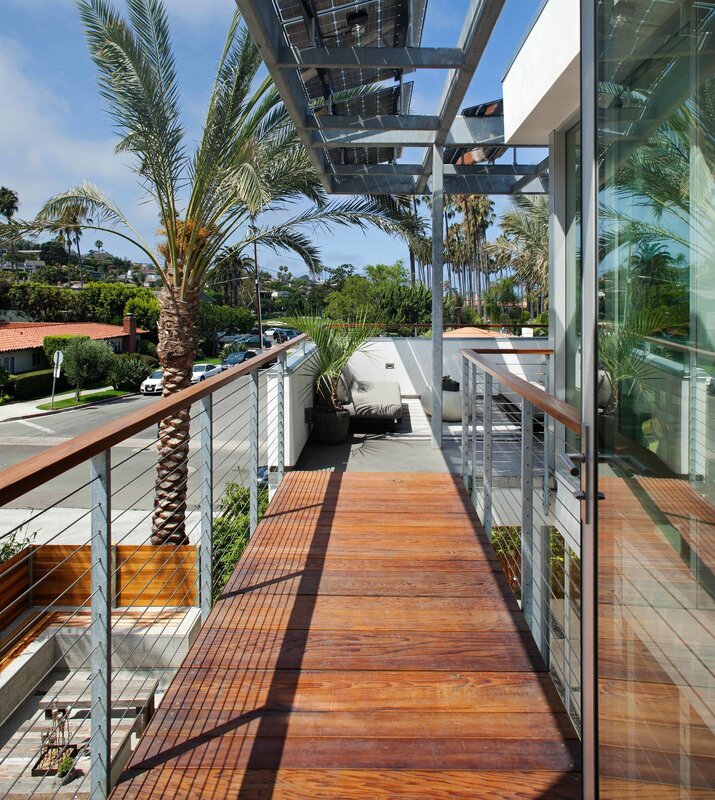 Much of the home’s design is based around a large, structural steel trellis supported by the second floor balcony. The top of the trellis is formed by frameless solar panels that provide the family with the majority of their daily energy needs. The living room couch—a semi-circle design by Niels Bendtsen—is the centerpiece of the open-plan living space. The rolling kitchen ladder is by Bartels Doors, and the kitchen island, pantry, and cabinets were custom made by Hill Construction Company. In an effort to forego an air conditioning system, domusstudio architecture strategically placed windows and ceiling fans to welcome in ocean breezes. The Noorens also chose to incorporate a large, accordion-style glass wall into their living area. The wall folds away entirely, allowing airflow and open access to the outdoor spaces. Local wood, contrasted with steel and concrete elements, comprise the home’s modern palette. The light fixture is by German designer Ingo Maurer; the dining room table and chairs are from Crate & Barrel. Article originally posted on Dwell in October 2014. When restaurateur Paul Hibler (Superba Food + Bread, Pitfire Pizza) and realtor Tiffany Rochelle purchased a dilapidated 1948 bungalow in Venice in 2012, they weren’t actually in the market for a house. They couple had, in fact, just settled into a newly remodeled home nearby. 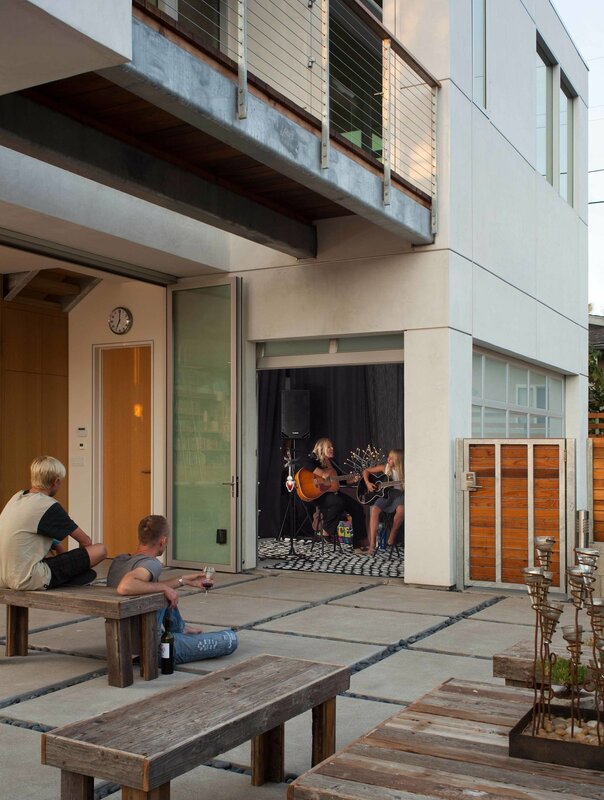 But when a coveted double lot became available, they recognized a rare opportunity to live on a charming Venice “walk-street,” and take advantage of its community-oriented, pedestrian-only walkways. So they sold their house in “two seconds,” hired interior designer Hope Alexander to make the two-bedroom bungalow inhabitable and moved in for a year with their 8-year-old daughter Grace while they contemplated what to do next. After visiting architect Kulapat Yantrasast’s concrete home in Venice, the couple were intrigued by the opportunity to build something different on a walkway lined with original beach bungalows and newer homes. Working with Yantrasast, who recently completed the Marciano Art Foundation on Wilshire Boulevard, the bungalow has since become a family compound that is an experiment in balancing indoors and out with public and private life. Instead of taking a common approach to a walk street — hiding the home behind a privacy hedge or fence — the architect designed a home that embraces the neighborhood. With floor-to-ceiling glass windows on the transparent first floor, it does not so much expose the family as engage them with their neighbors. After one year in the design stage and two years of construction, the couple moved into the house last spring. In the end, they are happy with the way the living areas balance privacy and community, both with their neighbors and with one another. Starting from scratch, Yantrasast designed a 3,100-square-foot house “from the inside out” rather than the outside in. The vision was to balance family and community life while giving everyone their own spaces to exist and function. The house is a series of contrasts — the first floor is composed of concrete and glass while the second floor features a warm wood floor and colorful Granada tile — but then so is the couple. “I’m an introvert and he’s an extrovert,” Rochelle says with a smile. The first floor opens to both the front yard and a rear courtyard and back house. The grand communal area consists of a living and dining room, office and kitchen that is supported by concrete plinths. From the back courtyard, the second floor is reminiscent of a freeway overpass. There is no front door, only sliding glass pocket doors. “We have the kind of house where we open the doors and the whole neighborhood comes in,” Hibler says. While the ground floor is all about community, the second floor is intimate with four modest-sized bedrooms connected by a long corridor. In a nod to the walk street, the bedrooms become a community of bungalows with gable roofs. “When you are in your own room, your room is your form and universe,” says Yantrasast. “Each room is designed by what each person wants it to be.” In a break from the first floor’s concrete walls, floors supports and glass, the second floor has a bohemian feel with warm plywood paneling, rustic wood floors and colorful Granada tile in the bathrooms. A barn-like back building, which is built the same width as the main house, features a garage, pottery room for Rochelle, and a man cave for Paul. “You have life in the garage building,” says Yantrasast. Rochelle’s room can be used as a pottery studio, or guest room. “It’s my getaway,” she says. Not surprisingly, Hibler’s room next door doesn’t get a lot of use. “I don’t like to be alone,” he says. The living room and office are separated by an enormous macramé wall hanging and a custom bookshelf that can be open or concealed, depending on what you place on the shelves. 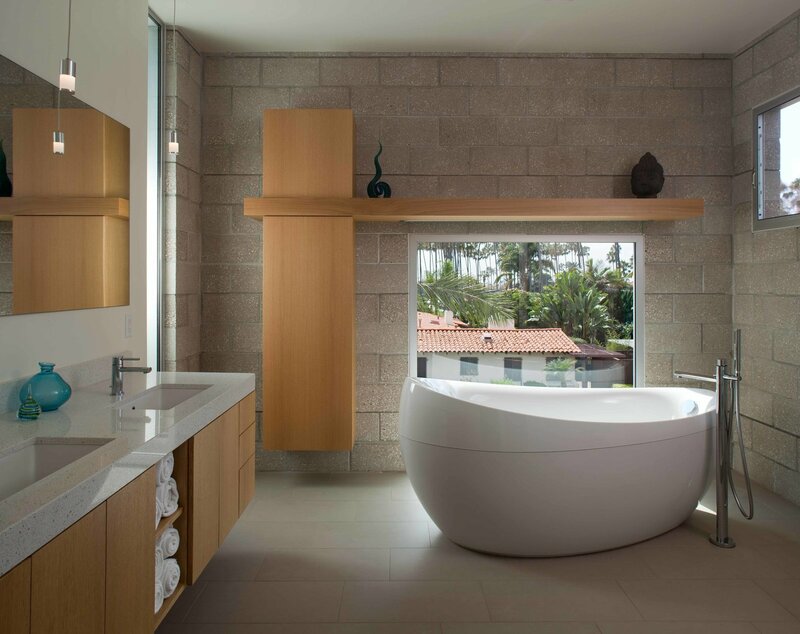 In the master bathroom, Yantrasast designed a floating two-sided vanity for Hibler on one side and Rochelle on the other. “It’s the key to a happy marriage,” Hibler says with a laugh. Hibler says the home’s design sensibility was clear: “We didn’t want to put up a wall. I wanted something crazy – communal and not highly finished.” When the couple want privacy, drapes shield the first floor from the Venice walk street. “You want to open the house to the community but you also need a shield and a screen,” adds Yantrasast. Originally posted on LA Times in June 2017.